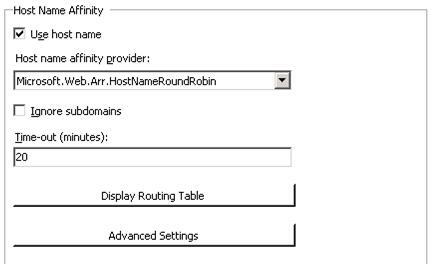 This topic leads you through the steps to configure Microsoft External Cache for IIS 7.0 and above, which can be used to manage the host name affinity data between multiple instances of Application Request Routing (ARR) servers. The host name affinity feature is used. There is more than one ARR server being used in the environment. 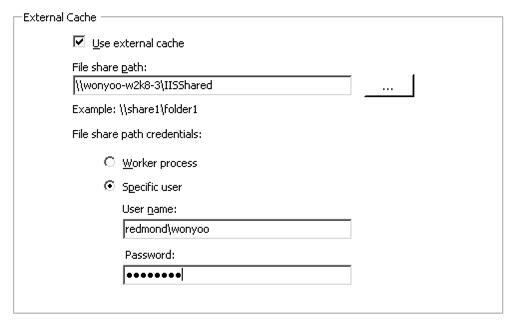 External Cache is a disk-based cache module for IIS. Minimum of two IIS 7.0 or above on Windows 2008 (any SKU) or newer installations. Microsoft Application Request Routing Version 1 and dependent modules (which includes Microsoft External Cache Version 1). Minimum of two application servers with working sites and applications. One file share where ARR can read and write files. Download Microsoft Application Request Routing Version 1 for IIS 7 (x86) here. Download Microsoft Application Request Routing Version 1 for IIS 7 (x64) here. Follow the steps outlined in this document to install Application Request Routing. You must have at least two ARR servers and two application servers. 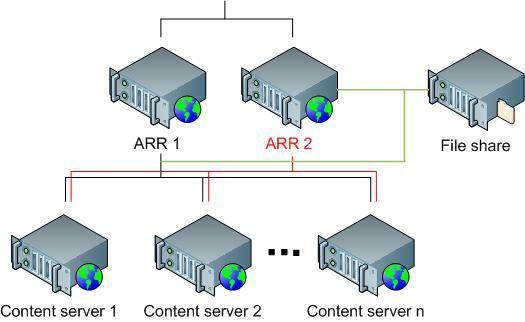 You can use a shared configuration to keep the ARR servers configured the same way, and use another shared configuration to keep the application servers in sync. For more information about shared configuration, refer to this article. As another prerequisite, you must have defined and configured a server farm using the steps outlined in Define and Configure an Application Request Routing (ARR) Server Group. Step 1 - Enable External Cache. Select the server farm that has been created for this walkthrough. As mentioned above, External Cache is needed only if host name affinity is used and there are multiple instances of ARR. Therefore, ensure that the Use host name checkbox is selected. Select the Use external cache checkbox to enable External Cache. The File share path text box is a required field, and specifies where the ARR servers will access to maintain the host name affinity state between the ARR servers. Repeat the steps above on all ARR servers. To verify that the feature works, send a request with a specific host name to one of the ARR servers. Make a note of which application server this host name is affinitized to. Send the same request to the remaining ARR servers. Regardless of which ARR server is handling the requests with this host name, they all should be routed to the same application server. You may also want to verify the file share where the data is being written. Open a command prompt with administrator privileges. Achieving high availability and scalability: ARR and hardware load balancer. Achieving high availability and scalability: ARR and NLB.